You know how some days you just get nothing done. You start out with such great intentions but everything seems to go to pot and by the end of the day your To Do list is the same length it was in the morning and you have a nasty feeling you’ve been just a wee bit lax. Yesterday was one of those days for me. By 5pm I looked around and realised I had got nowhere. All the writing plans for the day had come to nothing. I felt unsettled and annoyed with myself. There was only one thing for it, head for the kitchen and start making something nice for supper. I wanted something hearty but easy, filling but fun and most definitely tasty with full on flavour. It had to be a curry! Now in times past I would have reached for a tin or jar of curry powder but no more. 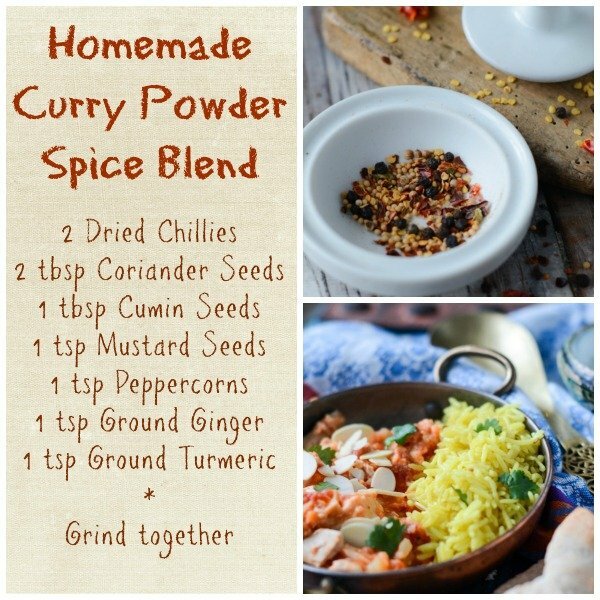 Nowadays I make up my own blend from dried chillies and spices and have a little jar of it in the larder ready to use at a moment’s notice, when I get that feeling that only a curry will hit the spot and fix the day. This is really easy to make and these measurements will make about 5 tablespoons of the blend. Just store it in a little jar and keep it for up to 1 month. Store bought spices are usually good for up to 6 months once opened and before they start to lose their flavour but once you have ground them it is best to use within a month for the best possible taste. Crumble the dried chillies and in a small pan dry fry the chillies along with the coriander seeds, cumin seeds, mustard seeds and peppercorns. You just want these to toast until they release their fabulous scent. Don’t leave the pan this only takes about 2 minutes and you don’t want them to burn. Mix in the powdered turmeric and ginger and grind your spices all together either in a mortar and pestle or in a coffee/spice grinder until you have a nice powder. Store in an airtight jar in a cool place for up to a month for optimum freshness. I just used a teaspoon of my curry powder with leftover cooked chicken, added a chopped onion, clove of garlic and tinned tomatoes and simmered for 20 minutes. Easy comfort food with fabulous flavour. Some days you just don’t get the things done that you plan to, then the best thing to do is do something you like for a change of pace and scene. For me that’s heading for the kitchen and the comfort of food. Maybe today I’ll get things done……. Crumble the dried chillies and in a small pan dry fry the chillies along with the coriander seeds, cumin seeds, mustard seeds and peppercorns. You just want these to toast until they release their fabulous scent. Don't leave the pan this only takes about 2 minutes and you don't want them to burn. I had a day like that today. Even though I work from home, it took forever to get the work done today. Yeeesh! That curry looks wonderful. What type of rice is that? The curry sounds very easy to make. Thanks so much for sharing your easy recipes. It is much appreciated! Have a nice weekend, Karon! The rice just basmatti rice with some turmeric added when cooking and coriander pods. A few coriander leaves to decorate. Tasted great and just what I needed after my useless sort of day. Glad I’m not the only one!